Crude oil (NYSE:USO) sold off aggressively today as it lost over 5% to finish at around the $45.50 level. Therefore we have confirmed that a new intermediate cycle has not begun yet as the March lows ( where some analysts believed that these lows marked the beginning of a brand new intermediate cycle) have been breached. This is where things get interesting. Why? 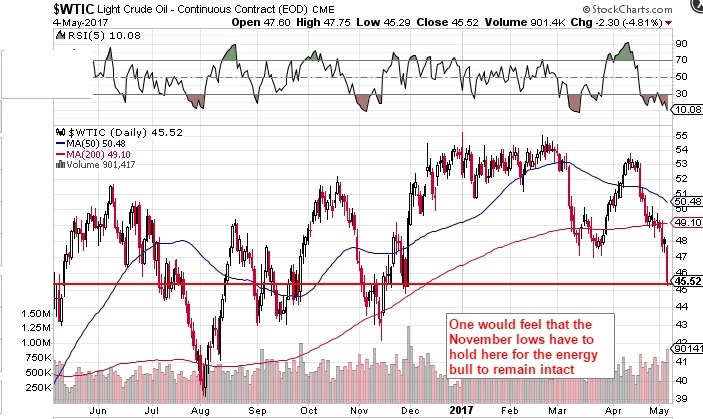 Because the November lows definitely marked the last intermediate low and this support level is at around the $42 level in crude oil. If these lows get breached, then this would mean that this particular intermediate cycle will not be making higher highs which would mean the bear market in this asset class is not over yet. Energy bulls have a nice setup here as the risk is pretty small if we get more weakness. By buying here and placing a stop at the November lows, one would be risking a small amount percentage wise to potentially make a lot. In the current intermediate cycle, crude got to the $55 level. If the bull remains intact, these highs should get taken out over the next cycle.